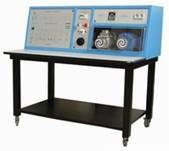 The DI-4000 series of educational benches and units allow the best training covering for both theoretical and practical topics. 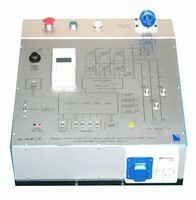 Each product can be connected to PLC or PC, for external control. DI-4000 offer the state-of the art technologies and a great range of operational opportunities. 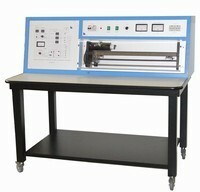 The bench has been designed to study AC industrial drives (inverter) safely and easily. This model uses the up-dated digital inverter with vectorial control with three-phase asynchronous motor. 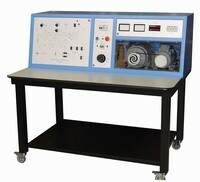 On the clear synoptic panel there are the main test points, regulations, PC interface, PLC interface and instruments. To study AC industrial drives (inverter) safely and easily. This model uses the up-dated digital inverter with vectorial control with three-phase syncronous motor. The bench can be managed both manually or through PLC or/and a PC using supplied software. 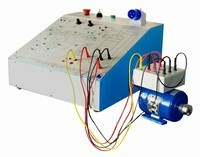 Highly effective educational system, designed to carry out a great range of exercises about dc motor control. The model DI-4000/RD has been designed to carry out a great number of exercises in power electronic field with attention to the single phase and three phase rectifier methods with uncontrolled, half controlled and fully controlled bridges. It can work both at high and low-voltage to avoid any risk for students. This highly effective system designed to carry out a great number of exercises in power electronic field with particular attention to the single phase and three phase rectifier methods to control a AC and DC motor. It can work both at high and low-voltage to avoid any risk for students. Modularity allows to grow the system step by step. Max available power 1 kW in high voltage mode. With this unit it is possible to connect any kind of DC motor up to 1 KW POWER. On the panel there are all controls and signals in order to evaluate the behaviour of the drive and motor. The unit allows to connect any kind of AC three-phase motor up to 1,1 KW POWER. On the panel there are all controls and signals to evaluate the behaviour of the drive and motor. RS-232 interface and software are also provided. This highly effective system designed to carry out a great number of exercises in power electronics involving the most important electronic components and circuits nowaday used in power electronics such as DIAC, GTO TRANSISTOR, JFET, MOSFET, IGBT, UJT, THYRISTOR AND TRIAC. It is also possible to investigate the single phase and three phase rectifier methods with uncontrolled, half controlled and fully controlled bridges. This highly effective system has been designed to carry out a great number of exercises in power electronics involving the most important electronic components and circuits nowaday used in electric energy conversion. To study the single-phase and three-phase rectifier methods with uncontrolled, half-controlled and fully-controlled bridges. 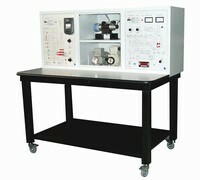 The trainer operates in low-voltage to avoid any risk for students.